Model FTV220-000 Frequency to Voltage Converter Module is designed to provide a means of converting digital pulse frequency signals to an analog voltage or current. The frequency input signal is optically isolated from the analog output circuitry. The module also provides an isolated +15VDC power supply (rated at 100mA maximum) to power an external encoder. Calibration of the minimum and maximum input frequency is accomplished by a contact closure connected to the Teach input terminal. The output signal is conditioned by scaling circuits which can be modified via multi-turn OFFSET, BIAS, and GAIN potentiometer adjustments. Terminal strip connections are provided for an optional external TRIM pot. A multi-turn TRIM RANGE adjustment is also supplied to limit the range of the external TRIM pot. 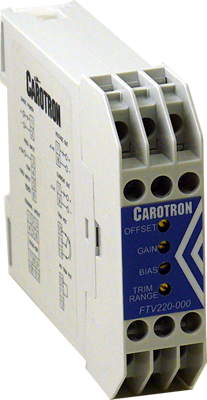 The output circuit can be configured to source either a voltage or current. Typical output ranges are 0 to 10 VDC, 0 to 20 mADC, or 4 to 20 mADC.